Oblong's Mezzanine immersive collaboration platformOblong Industries has announced results of a survey the company conducted in mid-February at the Integrated Systems Europe (ISE) conference. Among the insights gained from live, one-on-one interviews with industry respondents at the show was a strong demand for more immersive interaction with teams and information. Close to 89 percent of those polled “agree” or “strongly agree” that engaging with information in a more interactive and immersive way would help complex business problem solving. As defined in the survey, immersive collaboration includes spatial, multi-dimensional, and interactive components. 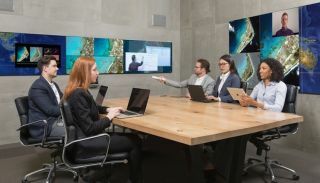 Only about half (52 percent) of survey respondents said their existing office collaboration system is immersive, yet respondents also estimated immersive collaboration could drive a 65 percent improvement in productivity during meetings. When asked whether their employer offers the right collaboration tools to work effectively with remote team members to solve complex business problems, the most commonly selected response (39 percent) was “neutral.” This suggests that while organizations may be providing some level of technology for distributed teams, it may be an incomplete toolset that still leaves room for enhancement. Forty-two percent of respondents said their biggest challenge with their meeting room technology today is technical delays in starting the meeting. This indicates the need for collaboration solutions that provide seamless connectivity, as well as easy-start technology that doesn’t require a lengthy, involved ignition process. In addition to the technology that powers meetings, the people involved in the meetings is also changing. Today’s workforce is largely made up of millennials that are bringing forth a new set of workplace expectations. On engaging this audience, 52 percent of survey respondents said they believe flexible working (remote work, work/life balance) is the most important aspect. Twenty-nine percent said energizing workspaces, including the latest technology, was most important. Respondents indicated the increasing frequency of important planning and decision-making meetings taking place in small groups of two to six people. For meetings focused on timely decision making and/or issue resolution, more than 95 percent of respondents said at least half of these take place in small groups. Ninety-four percent of respondents also noted that at least half of their meetings focused on project advancement take place in small groups.